Today marks 38 years since I left Brooklyn for basic training at Great Lakes, Illinois. Within a week of arriving there I was given a book which I still have today and use each week. This is the story of that book and what is has come to mean to me. I have a lot of books. And I've read them all. They are my friends and are all special to me, though some more so than others. This book is one of the more special ones. 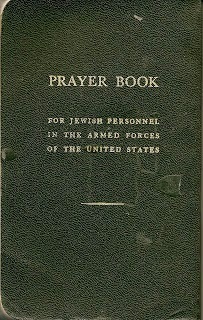 I received this book while in Navy boot camp at Great Lakes in 1976. It has literally been around the world with me 3 times. And even today I use it for weekly Sabbath Prayers. But what makes this book so extraordinary is that it was given to me by the Base Chaplain. Why is that extraordinary? Let me explain. We live in a self described "Christian" nation. But freedom of religion, and the right to worship as one pleases, are both principles which form the core of our democratic Republic. That the power structure of this nation saw fit to include my religion in its' plans when organizing the Armed Forces is nothing short of amazing to me. That the book was handed to me by a Christian makes it even more so. In short, this book is emblematic to me of what we do best as Americans. We respect, and we tolerate one another’s differences in points of view. From politics to God we are a people that are reasonable. We are founded upon the principle of "inclusion" rather than "exclusion." I find that principle remarkable.